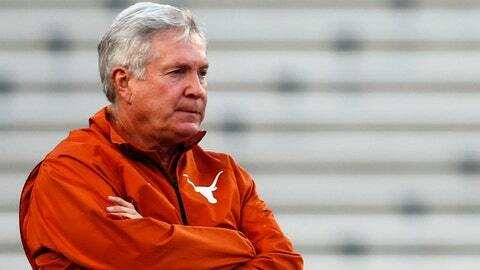 Mack Brown was a master at managing the distractions of being Texas' football coach. David Fowler was boarding a boat between Zambia and Botswana once, waiting to be taken across a river, when a boy approached. He was selling little souvenirs and caught a glimpse of Fowler, wearing a Texas T-shirt. Fowler isn’t as well known as the football coach or the president or certain alumni, but he very much represents the university wherever he goes, making sure to always wear Longhorn garb. Next year will be Fowler’s 50th as an engineering professor at Texas, making him something of a chief in the Cockrell School and about as distinguished an academic as Austin keeps. Since 2004, he’s also served president Bill Powers as the chair of the men’s athletics council. So here was Fowler, in Africa on a trip, representing the academic and athletic prestige of Texas, when the boy looked at him. He studied Fowler’s shirt, the orange, the familiar symbol, and as Fowler headed for the boat, the boy surprised him. He made a fist and then extended his pinkie and forefinger. This is the power, the beauty, of Texas. It’s the reason Texas is considered the best college football job in the country and also one of the most difficult. It’s why the university announced Wednesday afternoon that athletic director Steve Patterson has appointed an eight-person search committee and retained the firm Korn/Ferry — which played a role in hiring Patterson — to assist in the hiring of Mack Brown’s replacement. The committee includes a banker, an accountant, an oilman, a former U.S. ambassador to Switzerland and Liechtenstein. Powers said at Brown’s retirement press conference last Sunday that this new hire will be Patterson’s, and that may be true. Football coach –> athletic director –> president –> chancellor –> board of regents. All of them have their say, but search committee or not, it ultimately comes back to Powers. “The president is the one who hires and fires,” Fowler told me. As of Wednesday, at least 10 college and pro coaches with other jobs — Nick Saban, Les Miles, Jim Mora, Jimbo Fisher, Kevin Sumlin, David Shaw, Todd Graham, Mike Tomlin, Jim Harbaugh, Chip Kelly — have been forced into public comment regarding the Longhorns gig. Many more have been rumored to be “good fits” or “interested,” including Art Briles, James Franklin, Mike Gundy, Mike McCarthy, Jon Gruden (current broadcaster) and others. The list never ends because, again, it’s Texas in all its beauty. We need to slow down a little bit, though. The search will proceed over the next few weeks, and whether its Patterson or Powers or eight people deciding on one football coach, there are three primary questions to the search that haven’t changed. Who can handle everything, other than football, that comes with Texas? I’m not sure we’ve yet realized how skillful Brown was at this part of his job in 16 years at Texas. It might have been his best attribute. It’s more management than coaching, because, as Fowler described, everybody who’s paying a price wants their piece. Those responsibilities aren’t unique to Texas, of course, but the scale might be. If you’re a coach with one of the handful of best jobs in all of football — and that’s the bar Texas has supposedly set for this hire — would you want that commitment? Why leave your $5 million job in Baton Rouge or College Station, where the donors aren’t so hungry? Why leave Philadelphia or Pittsburgh, where you can make $7-8 million per season and without dealing with NCAA rules or spending significant portions of your days kissing hands? Oh, and there’s also an in-house television network with programming demands. An ability to manage those external factors — gosh, so Saban of me — will always be an important part of coaching at Texas. Who will place the most value on upholding an academic standard? Publicly, nobody cares that much about GPA. But Texas cares greatly about its academic prestige and will make sure the next coach does as well. Much of the massaging of that relationship is the job for Fowler and the council he oversees. They meet annually with all of the coaches to ensure an infrastructure is in place. That infrastructure includes recommending incentives for coaches whose teams meet GPA thresholds. But, as Fowler noted, this is an important component of the search, and the university will place financial weight on the new coach for winning this part of it, too. Who can do A and B while winning the most? At his press conference Sunday, Brown stood in front of the cameras and delivered clean truth. “The standard is really high here,” he said. “You’d better win all of them.” Brown said winning comes first, and essentially there is no second. The dirty trick in this might be that winning doesn’t come a la carte. At Texas, you can’t just win and do none of the other stuff. Texas IS all of the other stuff. Finding the person who’s equally willing and able to ride through the regents and rich donors, through the wide-open Texas field of people who want a piece, and deliver on each one of the university’s high standards has always been Powers’ predicament. He can assign the hire to his new athletic director, who can then assign a king and all of his men to a search committee if he chooses. Maybe it helps. Who knows? Everything in this process has been excessive, from the media/fan speculation to the administration’s convoy, but nothing fundamental has really changed.